If you have been thinking about buying a Roku, this weekend might be a good time to do it. Roku is selling a new Roku LT for only $49.99 and is selling their Roku 2 HD Player for $59.99 – both with free shipping. If you’re not sure what a Roku is, you might want to read our past post about our experience with the Roku Player. Both models offer the same content as the higher end Roku’s (over 300 entertainment channels available, including Netflix, Hulu and Amazon Video on Demand which have small monthly fees (Hulu Plus and Netflix cost $7.99 a month. Amazon Video on Demand offers 10,000 shows and movies and shows for free if you are a Amazon Prime member (which is basically a membership for $79 yr for free 2-day shipping and $4 overnight shipping with some other perks) and also has pretty current movies which can be purchased (via your Roku remote) from anywhere from $.99 to $4.99. Both models support HD, but only at 720p. This is good enough for many since 720p streaming is still very clear and is a good option to get an inexpensive second Roku or one to hook up to an older TV. 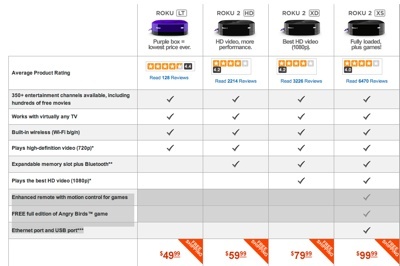 If you want the best video quality available (1080p) on a Roku, you’ll want to choose between the Roku2 XD ($79) or Roku2 XS ($99). Both are top of the line units, with the main difference being that the XS model has an enhanced remote (motion control for games), a free full additional of Angry Birds and an Ethernet port and USB port. Since choosing between these four models can get a little confusing, you can click on the ‘Products’ tab on their site to look at a feature comparison grid. Good luck and happy Black Friday deal hunting!